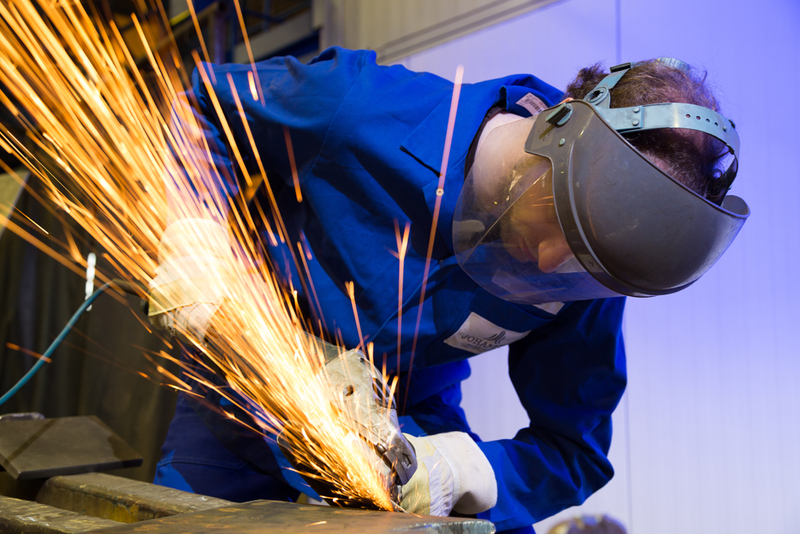 At MBI Construction Services, our fabricators can custom build and weld all sorts of equipment and metal. 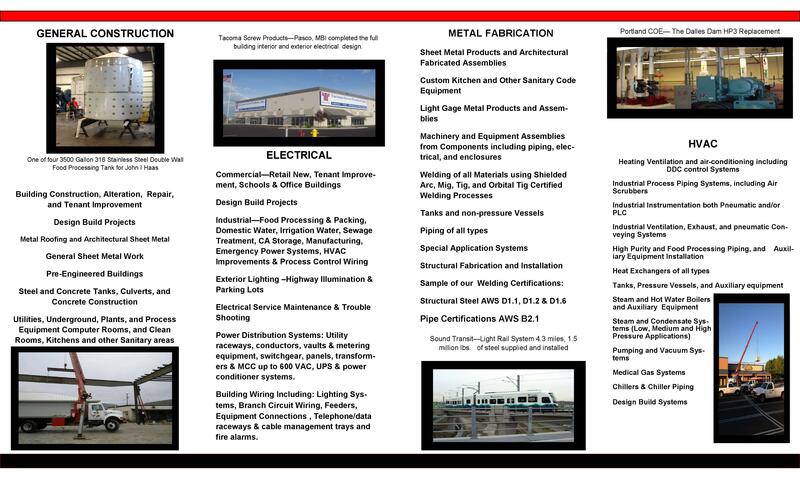 Contact us today for any structural metal fabrication, piping or welding services. MBI Construction Services has the established electricians and tools needed to perform a wide range of electrical services. Contact us today to learn more. Protect your heating and cooling system as it ages by contacting MBI Construction Services. Our licensed professionals can help keep your system from breaking down. Our skilled general contractors serve residential, commercial, industrial and government properties. Contact us today for all of your building upgrades, new construction and repairs in the Pacific Northwest. Your Premier Choice for General Contractors in Yakima & Kennewick, WA and other surrounding areas. The track record at MBI Construction Services clearly shows our commitment to excellence. There is no substitute for hard work and quality craftsmanship in our industry. That's why you'll never catch our contractors putting subpar effort into your job. For over 30 years, we have been your best choice for general contractors in states like Washington, Oregon and Idaho. We have a massive reach and scope of expertise in our industry, but no job is ever too small. Whether you need a general contractor for electrical services, HVAC maintenance or metal fabrication, you'll get the outstanding help and customer care you deserve at MBI Construction Services. Contact us today to speak with one of our representatives. We'll be glad to answer all of your questions. Industry experts and unparalleled services based in Yakima & Kennewick, WA and other surrounding areas. MBI Construction Services works on all residential, commercial, industrial and government properties. When you need the best general contractors in the Pacific Northwest, contact MBI Construction Services. We'll be glad to help. 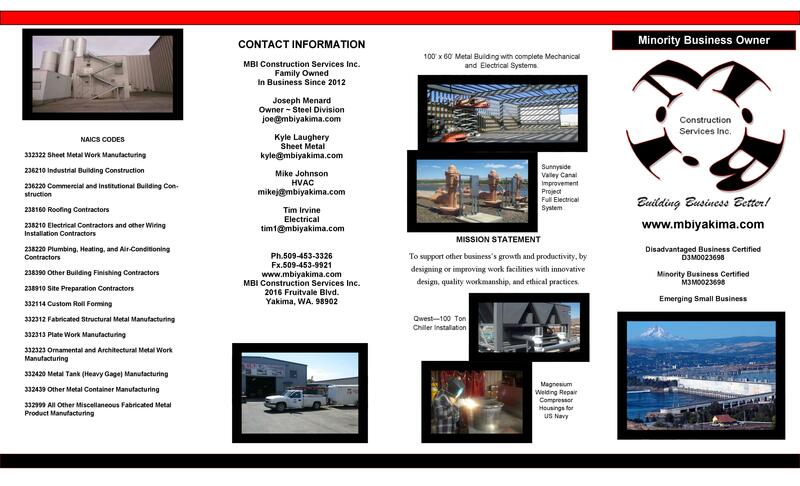 MBI Construction Services has been family owned and operated for over 30 years. Our mission statement is to support the growth and productivity of other businesses within our community. We do this by designing and improving upon work facilities with innovative designs, quality workmanship and ethical practices. If you need an electrician, general contractor or heating technician, MBI Construction Services has you covered. We even offer emergency weekend services for any issues you have. Contact us today at 509-453-3326 to speak with one of our representatives. We'll be glad to answer all of your questions and set up your appointment.